Perhaps you are a casual reader of comics. You've been picking up the main comics of Fear Itself and Flashpoint but aren't going to bother with all those countless tie-ins. This past Wednesday was the first time an issue of each came out on the same day, and maybe you haven't bought anything yet and are wondering just which event would be better to follow. Maybe you're going to get both no matter what but want to know which is more enjoyable. Well, I'll share my opinion about which I think is better based on what I've seen so far, and really, do you need the thoughts of anyone else besides me (yes, you do, but that's beside the point)? 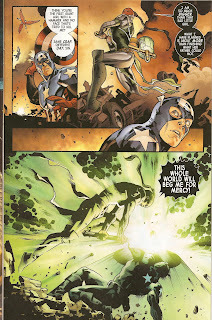 Fear Itself is going to be seven issues long, and having almost reached a half-way point at the end of the third issue I still don't get what it is really about other than a bad guy called, "The Serpent," being summoned and causing hammers to fall to earth that make heroes smash things. Flashpoint is only five issues long, but two issues in has a clearly defined purpose of Barry Allen waking up in an alternate universe and wanting to change it back. Flashpoint has done more story-wise in two issues than Fear Itself has done in three. These are facts (and kind of opinions). Oh wait, Flashpoint has more tie-ins than Fear Itself! Maybe all those tie-ins are because with the main-series having less issues you need tie-ins to fill out the story more, and with Fear Itself having two more issues to it than Flashpoint more interesting plot development and things can happen, right? Well, that is what would occur in theory, but in practice we just get a lot of very well-drawn pages by Stuart Immonen with heroes breaking things over double-page spreads. As for the claim that Flashpoint needs the story to be filled out, that doesn't seem to be the case. We get some fun scenes with alternate-universe versions of heroes and villains we know and its pretty clear what is going on. We have the option of buying their tie-in mini-series to get more of their story and to learn all about them and how they ended up where they are, but things are pretty understandable without us having to. 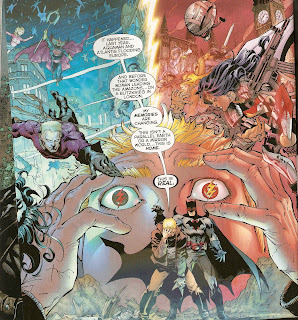 Flashpoint takes the heroes and villains we know and warps them into whole new and interesting ways. 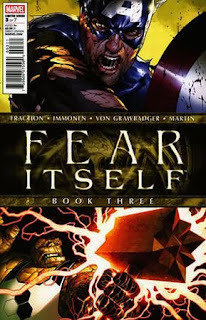 Fear Itself takes the heroes and villains we know and gives some of them new bulkier costumes and an anger-management problem while the rest of the heroes stand around whining about how it seems this attack is super-coordinated and really difficult to combat. 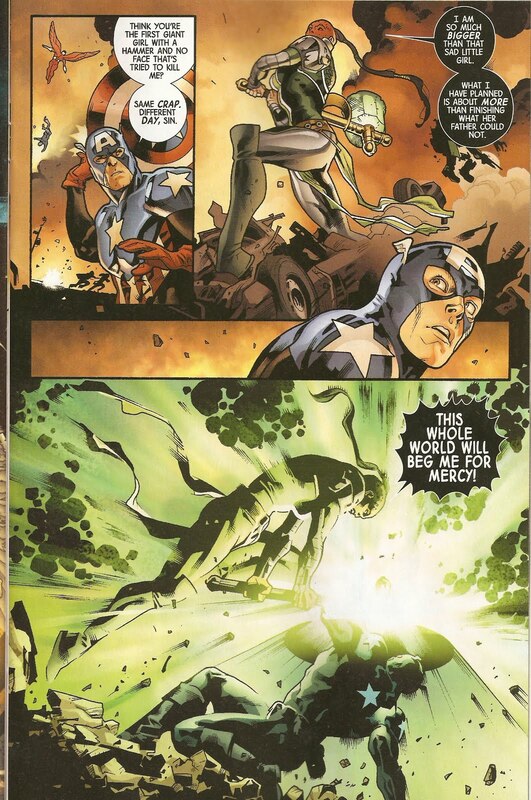 Well, if it's a big difficult fight, maybe you should follow the lead of one of the few characters who has some sense in this issue--Steve Rogers--and quit standing around and charge into the action to do something. I'm being hard on Fear Itself, but the action is good and kinetic, and the scene between Thor and Odin actually seems to have a slight bit of paternal caring--unlike earlier in the series when Odin was just a complete jerk to Thor. 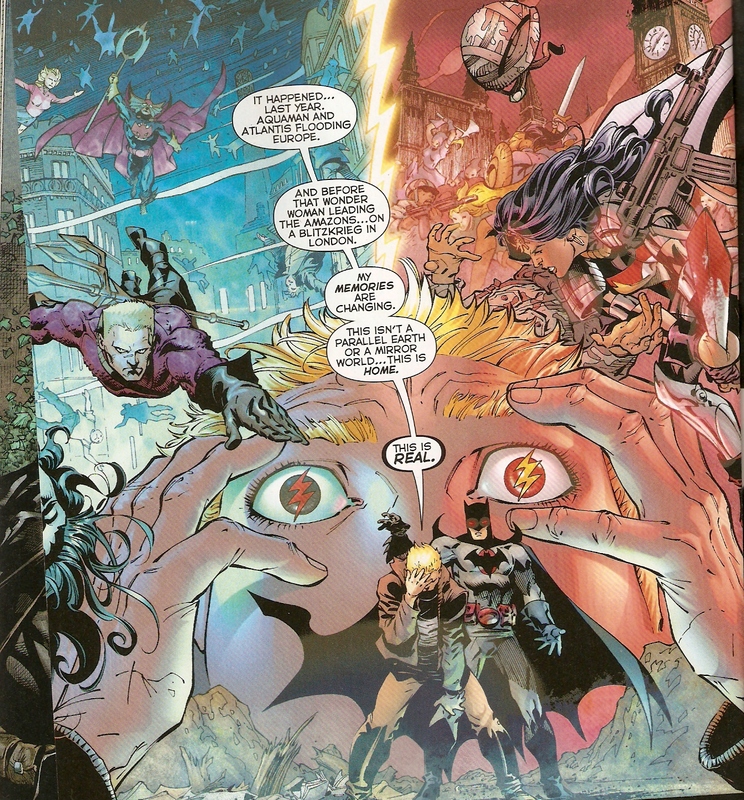 It's just that Flashpoint has better emotional moments too, such as when the Batman of the Flashpoint universe hears about who Batman is back in the normal world--and asks with all his heart if it would be possible to bring that world back (and if you know who the Batman is from the first issue's conclusion this is really touching). I truly did not expect to like Flashpoint as much as I did, I thought it was going to be lame, but instead Geoff Johns seems to have brought his fun and creative side to the project, and while I was wary of Fear Itself, it is a perfectly competent comic being turned in by Matt Fraction with very nice art (Flashpoint looks great too). It's just that if you told me I would be saying what I'm about to say in the next paragraph before these comics started coming out I wouldn't have believed you, but hey, it's a crazy world. 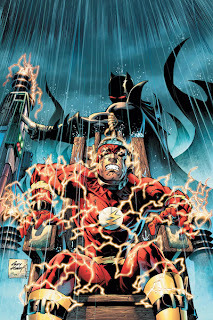 If you are only going to buy one of the big event comics, I would say you should probably go with Flashpoint. It's fun, clever, has a great concept with an alternate world that only Barry Allen seems to realize is all wrong, and at only five issues is shorter than some of the longer event comic series. Fear itself is a good comic, but the tale is somewhat convoluted and unless you want a lot of crazy action or only read the Marvel universe, Flashpoint is where most of the fun is at.